If you want to do text and data mining in the EU, you run into a complex legal framework of copyright rules. 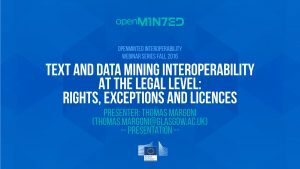 During the OpenMinTeD webinar of November 23rd , this legal framework, limits and opportunities were discussed with legal as well as non-legal TDM experts. Recordings of the webinar and the discussion are available online. The general legal landscape of the EU copyright framework that applies to activities relevant for Text and Data Mining. Limits offered by current copyright rules: which rights (e.g. right of reproduction and right of distribution) can be triggered by TDM activities and what does this entail? Opportunities: what are the existing copyright exceptions that could cover TDM activities? (including draft proposal for a Directive on Copyright in the Digital Single Market and other national initiatives). How likely is it to infringe copyright with TDM activities? There is a lot of uncertainty and unclarity surrounding licensing agreements. How likely is it you ‘pay double’ ( by asking for a specific permission while a license already grants that right but the licensee is not aware of it)? 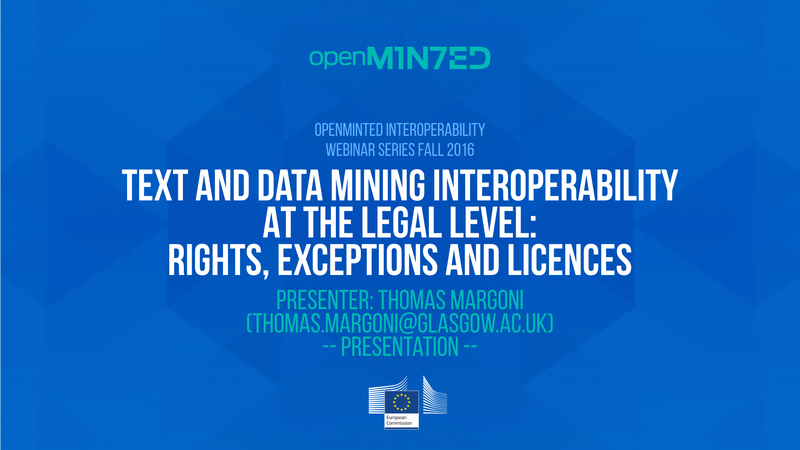 Might there be an interaction between a text and data mining exception and other existing copyright exceptions? What are the pros and cons of the proposed TDM exception in the European Union, and how does this relate to national TDM exceptions? Do you want to know more and see how the discussion evolved? The webinar and discussion are available online.